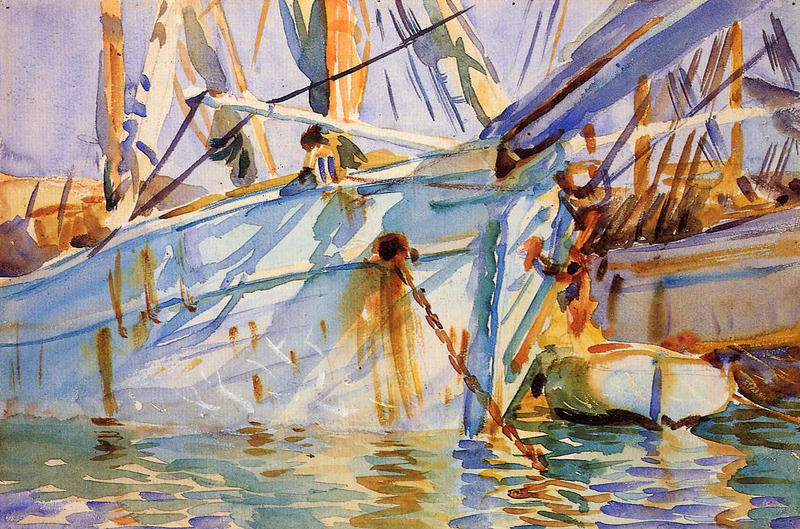 John Singer Sargent, In a Levantine Port (1905-6), watercolour and graphite on paper, 30.6 x 46 cm, Brooklyn Museum, New York. WikiArt. The third article in this series looked at the advances which occurred in watercolour paints and painting during the late nineteenth century, which made it a first-class medium alongside oils. This concluding article looks at some of the greatest watercolour painters of the end of the nineteenth and early twentieth centuries. Some of the core French Impressionists did use watercolours, but their preferred medium was overwhelmingly oil paint on canvas. That didn’t deter others from choosing to use watercolour, though. 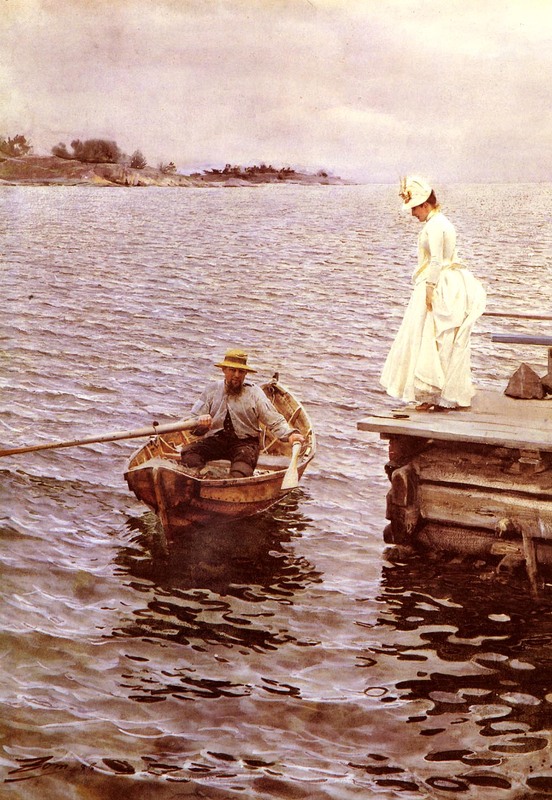 Anders Zorn (1860-1920), Summer Vacation (1886), watercolour, 76 x 56 cm, Private collection. WikiArt. Realist art wasn’t, in the end, killed by Impressionism, and many realists like Anders Zorn started their careers working primarily in watercolour. His meticulous detail and use of dense colour make his Summer Vacation (1886) almost indistinguishable from an oil painting. 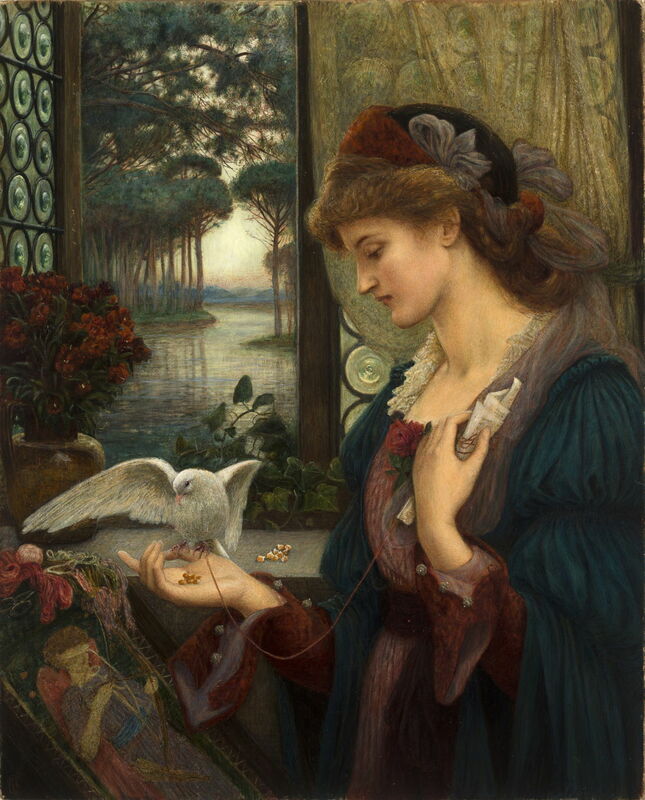 Marie Spartali Stillman (1844–1927), Love’s Messenger (1885), watercolor, tempera and gold paint on paper mounted on wood, 81.3 × 66 cm, Delaware Art Museum, Wilmington, DE. Wikimedia Commons. Marie Spartali Stillman, one of the last survivors of the Pre-Raphaelite movement, developed elaborate layered techniques which are still not fully understood. In this particular painting, Love’s Messenger from 1885, she has also incorporated tempera and gold paint, together with more opaque technique. Apparently her use of layers was painstaking, and prone to failure, which sometimes forced her to abandon paintings. 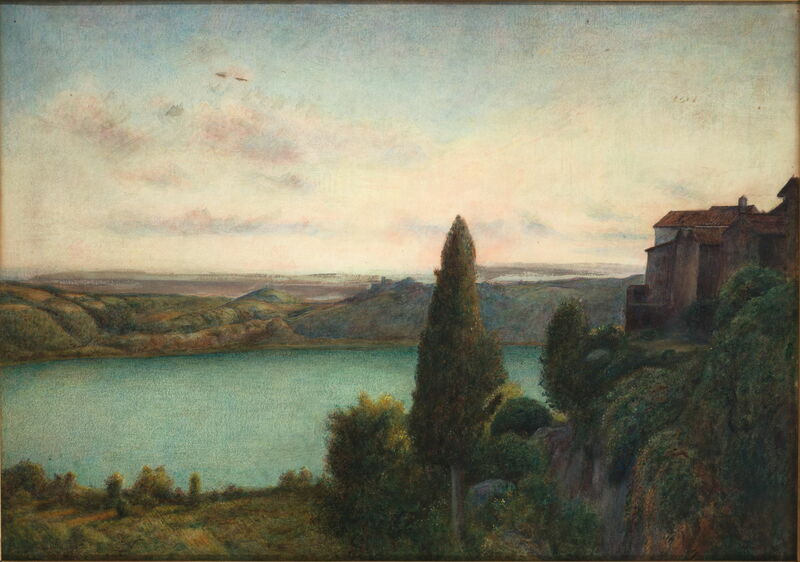 Marie Spartali Stillman (1844–1927), The Lake of Nemi (1899), watercolour and gouache on paper, 40.6 × 57.2 cm, Private collection. Wikimedia Commons. 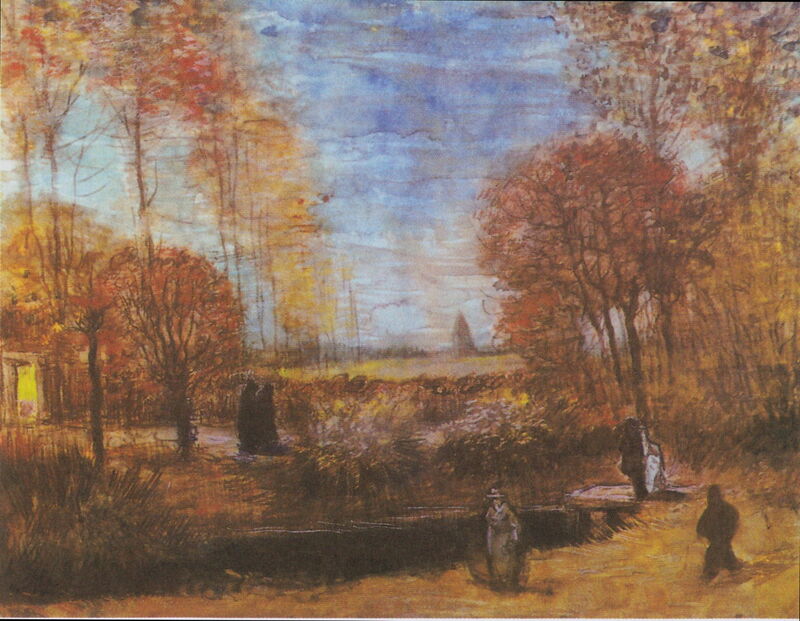 Stillman used similar methods for her landscapes, although these were not apparently painted in front of the motif. Giovanni Boldini (1842-1931), The Conversation (1870), watercolour on paper, Private collection. WikiArt. 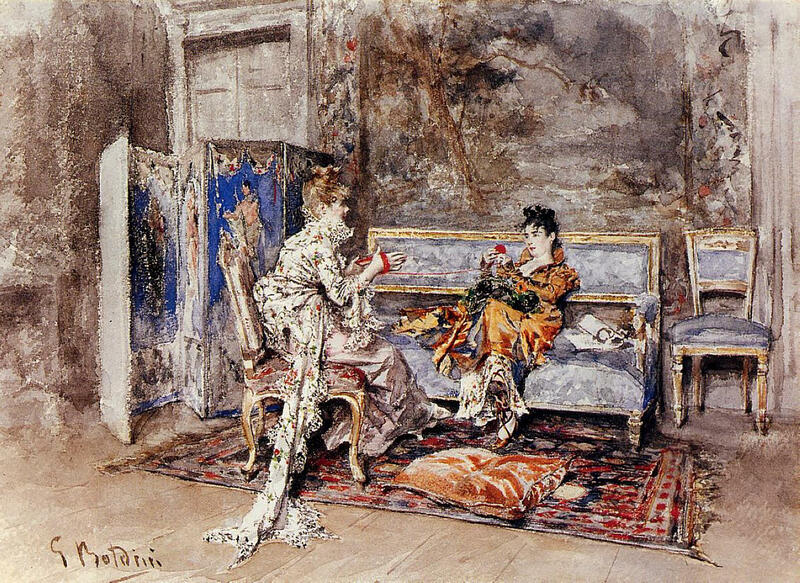 Of those on the periphery of the Impressionist movement, Giovanni Boldini painted some unusual watercolours, such as his The Conversation (1870), although he later seems to have worked almost exclusively in oils. Passages here show very controlled use of wet on wet application of paint, and several other techniques. Vincent van Gogh (1853–1890), The Rectory Garden in Nuenen with Pond and Figures (1885), watercolour, 38 x 49 cm, Private collection. Wikimedia Commons. Among the Post-Impressionists, Vincent van Gogh made some relatively early paintings in watercolour, such as The Rectory Garden in Nuenen with Pond and Figures (1885), but later worked almost entirely in oils. Paul Cézanne, though, turned to watercolour for some of his most remarkable paintings late in his career. 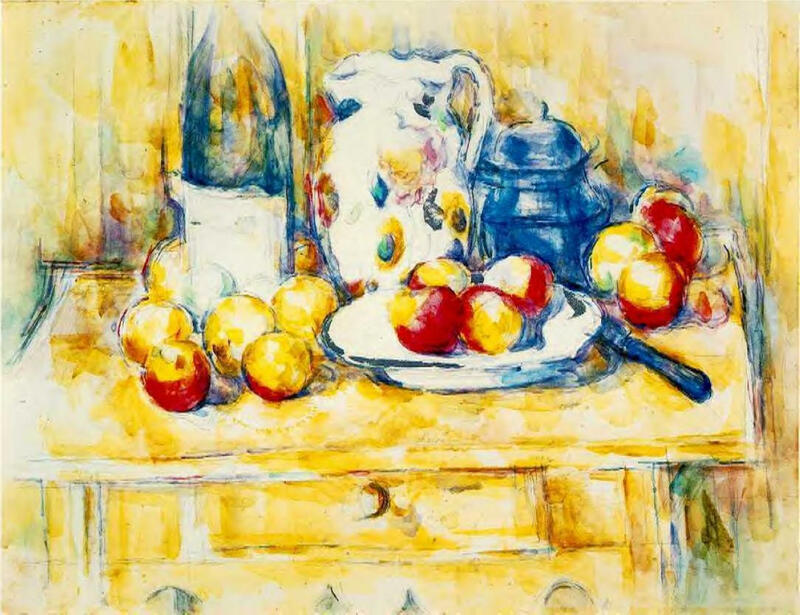 Paul Cézanne (1839-1906), Still Life with Apples on a Sideboard (1900-6), watercolour on paper, 47.9 x 62.9 cm, Dallas Museum of Art, Dallas, TX. WikiArt. Some of his late still lifes are watercolours, which are very high in chroma, and appear to follow on from his earlier oil works. Paul Cézanne (1839-1906), Almond Trees in Provence (1900), graphite and watercolour on paper, 58.5 x 47.5 cm, Private collection. WikiArt. Cézanne’s most unusual watercolours are late landscapes, such as his Almond Trees in Provence (1900). These have no parallel among his works in oils, and typically have very large areas of reserved space, with selected forms such as the almond trees here painted using flares of concentrated colour. They have no real precedent in painting, but unfortunately the artist provided no account of his intent, or other explanation. Their interpretation thus remains a matter of speculation. 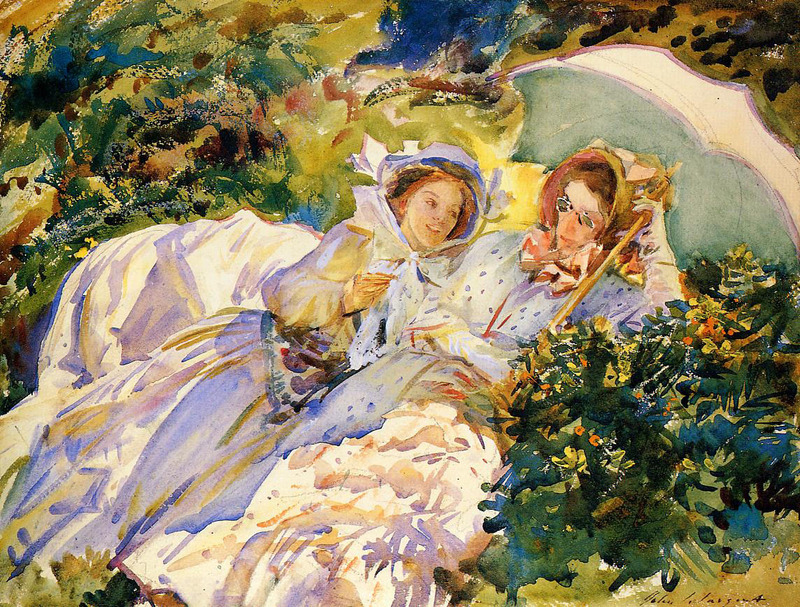 John Singer Sargent was one of the most prolific and accomplished watercolour painters after JMW Turner, and used a full range of specialist techniques in his extremely painterly works. John Singer Sargent (1856-1925), Scuola di San Rocco (c 1903), watercolour on paper, 35.6 x 50.8 cm, Private collection. WikiArt. 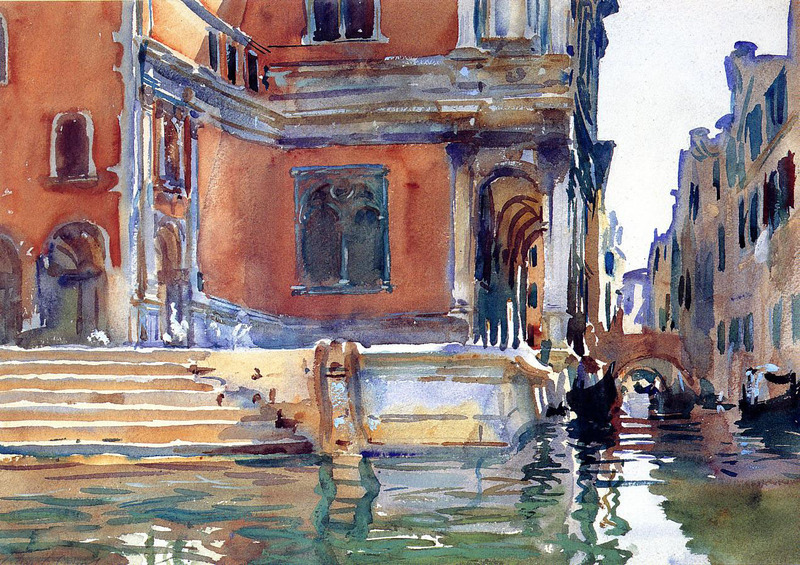 Sargent’s watercolours of Venice, here Scuola di San Rocco from about 1903, appear to have been painted with masterly ease. John Singer Sargent (1856-1925), Bedouin Camp (1905-6), watercolour on paper, 25.4 x 35.7 cm, Brooklyn Museum, New York. WikiArt. 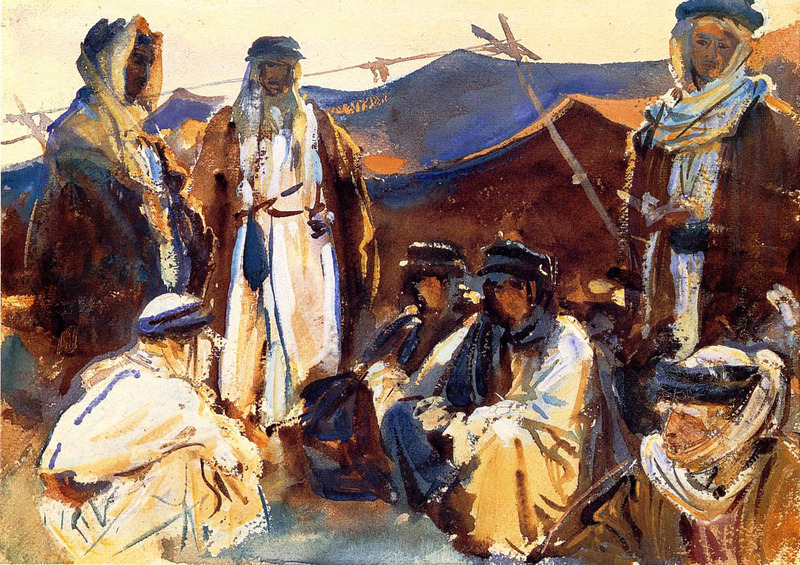 When Sargent was travelling, he made many impromptu sketches using watercolour, as in this painting of a Bedouin Camp (1905-6). John Singer Sargent (1856-1925), In a Levantine Port (1905-6), watercolour and graphite on paper, 30.6 x 46 cm, Brooklyn Museum, New York. WikiArt. Many of his best watercolours are rich in marks, which only make sense when assembled into the whole. These paintings are thoroughly Impressionist in most respects, with quite vibrantly-coloured shadows, for example. John Singer Sargent (1856-1925), Simplon Pass. The Tease (1911), watercolour on paper, 40 x 52.4 cm, Museum of Fine Arts, Boston, MA. WikiArt. In his Simplon Pass. The Tease (1911), the marks made to show patterns and shadows on the women’s clothing seem almost random in form and arrangement. He had a particular fondness for the use of wax resist, which he has applied here over a painted underlayer in the vegetation. 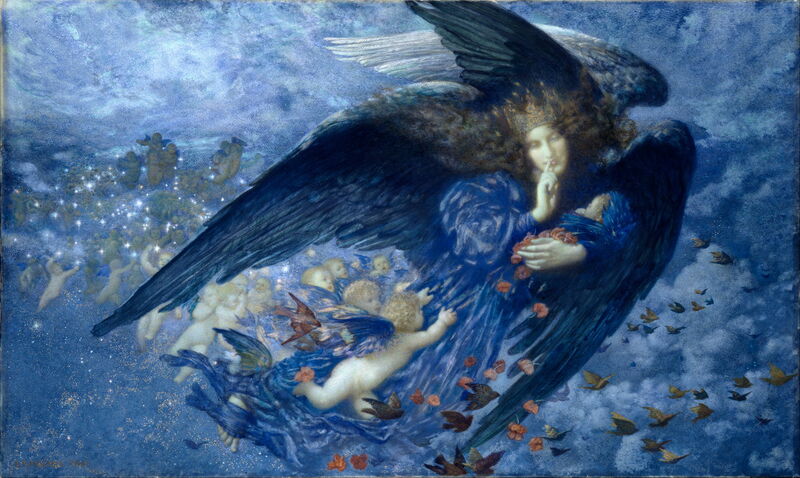 Edward Robert Hughes (1851-1914), Night with her Train of Stars (1912), watercolour, bodycolour and gold medium, 76.2 x 127 cm, Birmingham Museum and Art Gallery, Birmingham, England. Wikimedia Commons. In complete contrast, Edward Robert Hughes’ Night with her Train of Stars (1912) has been painted in a very controlled and meticulous manner, although it too uses advanced techniques, particularly in the sky and background. I suspect that some of the latter may have relied on the scattering of salt grains to impart its fine texture. More radically changing style in the twentieth century saw watercolour at the forefront. Charles Demuth (1883–1935), The Jazz Singer (1916), watercolour and pencil on paper, 32.4 x 19.7 cm, Private collection. The Athenaeum. 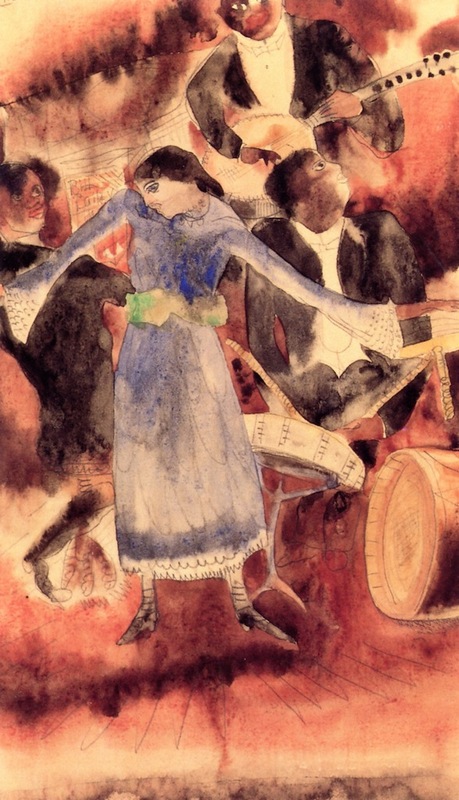 Charles Demuth’s The Jazz Singer (1916) shows a very contemporary subject expressed using established watercolour techniques such as wet on wet. A century after William Blake made his pioneering mixed media painted prints, artists more generally started to combine different media. 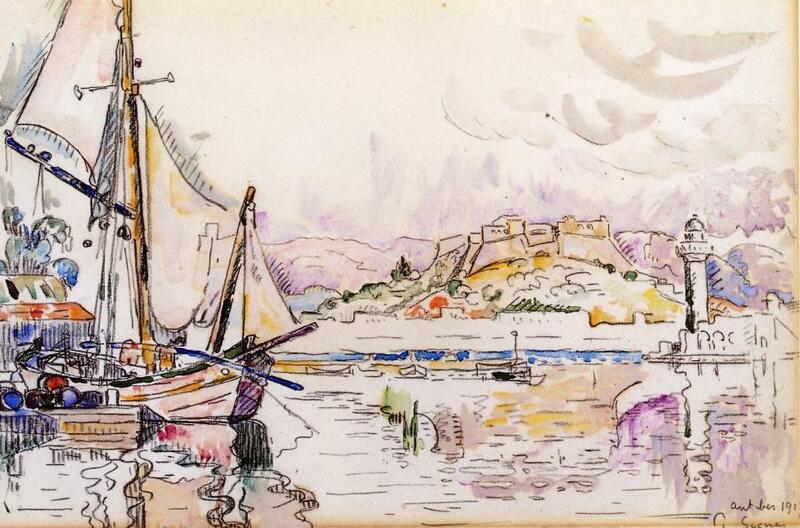 Paul Signac (1863-1935), Antibes (1917), watercolour and crayon, 29.85 x 45.1 cm, Private collection. WikiArt. Paul Signac painted many brilliantly-coloured views of the south of France using various combinations of watercolour and crayons. 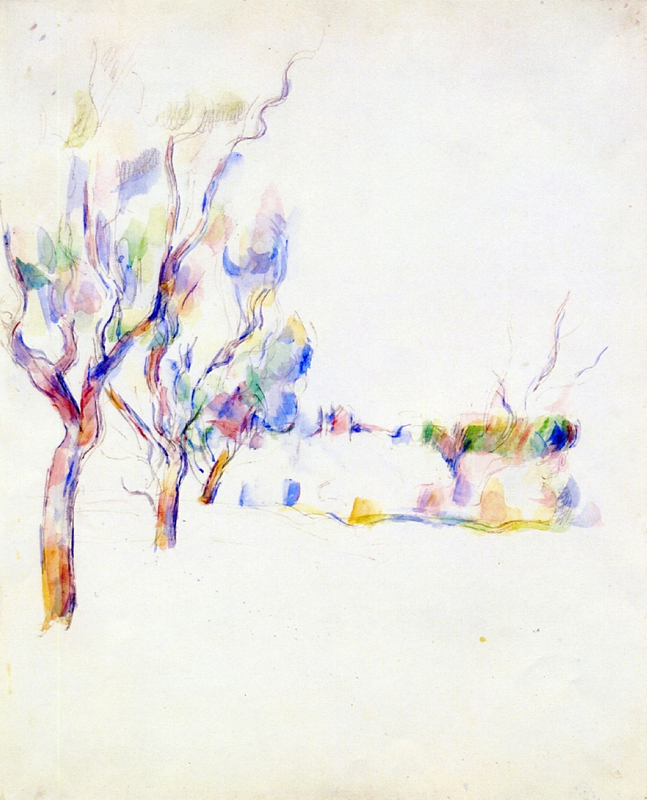 Some of these, such as Antibes (1917), also have substantial amounts of reserved space, although still far less than Cézanne’s late watercolour landscapes. 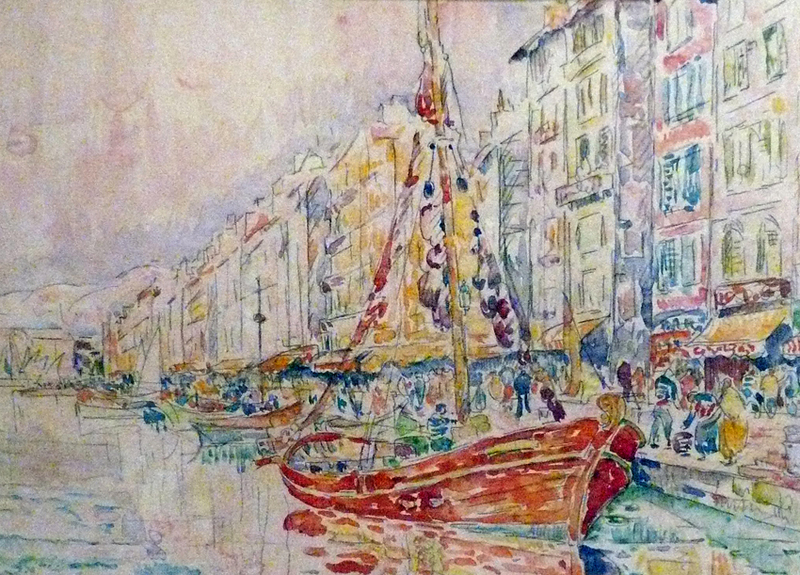 Paul Signac (1863-1935), The Old Port of Marseilles (1931), watercolour and crayon, Musée Albert André, Bagnols-sur-Cèze, France. WikiArt, Wikimedia Commons. Since then, watercolour has shown its flexibility in supporting new styles and techniques. A glance through the work exhibited at any of the major watercolour societies’ exhibitions will reveal a huge range, from realist pure transparent methods to abstract mixed media. 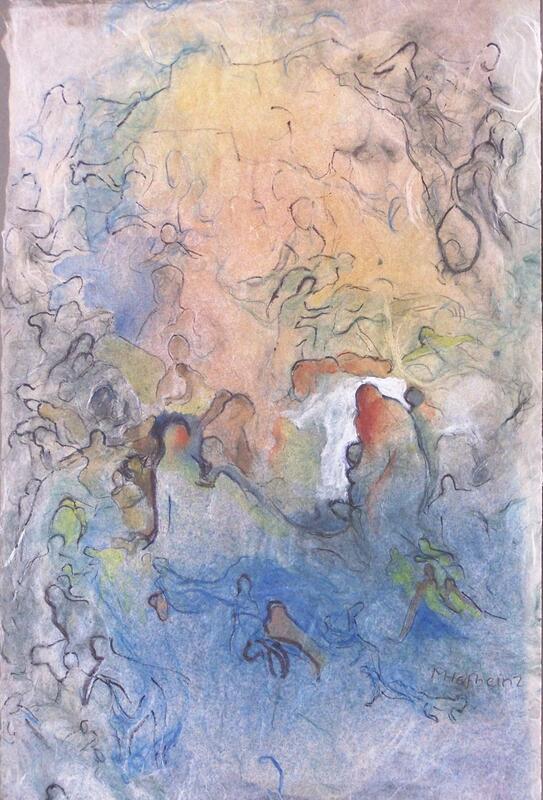 Margret Hofheinz-Döring (1910-1994), The Flood (1962), watercolour, 32 x 46 cm, Galerie Brigitte Mauch Göppingen. Courtesy of Margret Hofheinz-Döring / Galerie Brigitte Mauch Göppingen [CC BY-SA 3.0 (http://creativecommons.org/licenses/by-sa/3.0)%5D, via Wikimedia Commons. The most recent technical development has been the adoption by one paint manufacturer of a replacement binder for traditional vegetable gum: QoR paints are based on a synthetic polymer Aquazol® which has been used extensively as an adhesive and consolidant in the conservation of fine art. Coupled with synthetic varnishes and more lightfast pigments, it is likely to result in watercolour paintings which are far more robust than those of the past. Posted in General, Painting and tagged Boldini, Cézanne, Demuth, history of painting, Hofheinz-Döring, Hughes, painting, Sargent, Signac, Stillman, van Gogh, watercolour, Zorn. Bookmark the permalink.